This series of photos by Amar-Singh HSS was taken at Tambun Interior, Ipoh, Perak, Malaysia, on 5 and 12 April 2015. 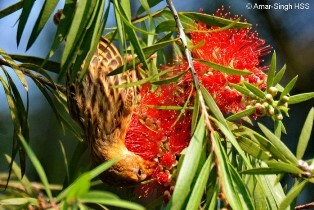 Amar spotted a small flock of 7-8 Baya Weavers feeding on the nectar of Callistemon sp. (Bottlebrush) trees. He first spotted this briefly with one bird at 8.45am in the morning. But on his way back at 10am he saw a small flock going from flower to flower to harvest the nectar. 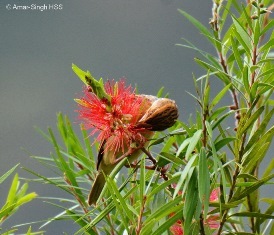 Amar wrote: "The Yellow-vented Bulbuls and Crimson Sunbirds were not pleased with this. I saw a Yellow-vented Bulbul chasing some way but it was futile task. Chase one and 5 more turn up behind your back. It was not easy to watch as they would go to the other side of the bush when I came to one side, so my video recordings did not work. But there is no doubt from numerous observations (see still images). 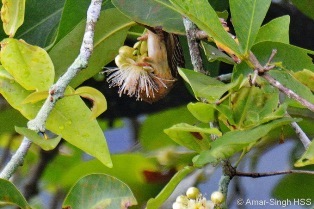 They are not feeding on the seed capsules or any animal prey in the tree but on the nectar." 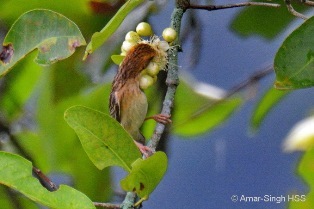 These photos were submitted to the listserver orientalbirdingpix@googlegroups.com in April 2015 by Amar-Singh HSS (Dato' Dr). 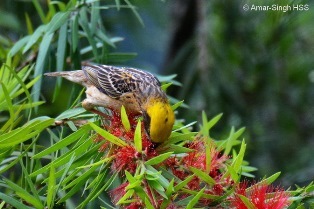 Many weavers, including the Baya Weaver, have been recorded as feeding on nectar - see list here.